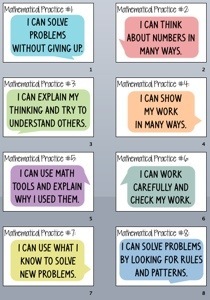 One really wonderful thing has come from the Common Core Standards: the 8 Mathematical Practices. Now, whether you love, hate or have no real opinion on the Common Core, please hear me out. you may have been hearing about), and enforcing the idea of accuracy and attention to detail. These just happen to be the skill sets for success – in any field! It is my observation that students who lack some or all (and many of the students I am teaching this year lack all) of these skills are struggling with learning. We can say that this is a problem of laziness, we can blame it on years of spoonfed students, we can fuss about how it is next to impossible to change students’ learning (not completely impossible! ), but in the end, we have to simply begin to eat this elephant. I believe that focusing on these 8 MPs will allow us and our students to taste success – of all kinds. At my school, we are encouraged to be consistent: enforcing student dress codes, the tardy policy, class behavior, and other important policies that affect our students. We talk about success and poster-ize all sorts of great pithy sayings. Then we lament the way the students ignore all the great ideas and opportunities. Why don’t we get consistent in a very specific way: the 8 MPs. Let’s apply them to every subject and evaluate students on how well they utilize these skills in every applicable assignment. Instead of warm and fuzzy quotes about success, make clear statements about the actual actions we require. Rubrics are a good start – for you and me! What do these 8 MPs look like for your lesson? What will the student be doing? What will you do to facilitate these actions? Second Bite: before and during a lesson, in addition to talking about the focus of the learning, also identify and recognize the practices that you see your students engaging in. A smile, a thumbs up, an encouraging comment; all go a long way towards motivating and keeping students trying. Third bite: grade for these practices. Let parents know what we need from Johnny and Suzy. That it’s about more than homework and cramming for a test. It is about more than just being able to work 20 identical algorithms without understanding. It is about giving their kids confidence, mining for that long-buried curiosity that will take them farther than anything else we can do as teachers. My posters go up Monday. I’ll keep you posted on the results. Oh, and could you please pass the salt?! So let’s say a television is falling on your head. Will a bigger TV kill you faster? You are standing on the sidewalk. Somebody yells, “watch out!” And you look up and realize a television is hurtling towards your head. You have 2 seconds to move out of the way. What floor was the television dropped from? This is a reverse of the classic egg drop problem, which asks the student to figure out how long it will take an object to fall from a specified height. The formula for gravity and time is usually provided. We are going to turn this lesson on it’s head, literally! Start with the question: So let’s say a television is falling on your head. Will a bigger TV kill you faster? Have the students make conjectures in their own minds. Have the silent thumbs up when they are ready. Pair students up and have them share their conjectures, giving reasons that the other person can articulate. Go around the groups and ask what they decided: what the question was asking, whether a bigger tv would fall faster than a smaller one, give the reason(s) they felt that was true or false. If your facility offers a one or two story drop (football stadium announcer stairs?) conduct this next experiment empirically. First, watch only the first part of the video, where the interviewer is asking random people whether a heavier ball will fall faster or the same as a lighter weight ball. Stop the video before they get to the proof part. Survey your students. See how many agree with the heavier is faster theory. Ask them why. Have them explain their thought process. At this point, you can take them outside, let them try it themselves with two different weight items, or you can play the rest of the video, or both. If you get to do the outside drop, bring a stopwatch. Set up some students to drop and some students to time the drop and determine how fast the ball drops. Have the students estimate the height (if you can, measure it ahead of time, so you can work the math first) and come back to the class. 2. Develop an understanding of the parts of the formula used in so many of their quadratic one-variable math problems, as they develop their speed of gravity based on the tests, or in discussion from the information from the video. I will tell you that the video gives the formula in meters per second. The formula in the Alg II Word problems are generally given in feet per second so take some time here to work the students through a conversion process, so they will see the variations as different ways to write the same formula. Rest or break here. Debrief the students, let them write out their understanding of the question asked in the title- will a bigger TV kill you faster? See how many students changed or enlarged their views. Have them articulate what changed, or if they thought objects would fall at the same rate, how did what they did support their initial thought. Pick up the next day with the formulas. Let the students (whole group) come up with thoughts as to how they are different and why one formula might be more appropriate than another. you are standing on the sidewalk beside a multi-story building. 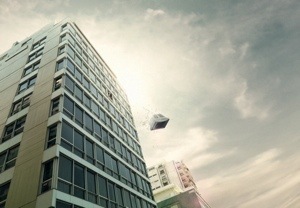 Above your head, someone has knocked a window air-conditioner out of the window. If you don’t move it will land on your head. You have 2 seconds to move. How high up does that window have to be to give you time to get out of the way? If you double the height, does that double the amount of time you have to move? The next step is group discussion. In groups of 3 or 4, have them share their ideas and work together to discuss how they feel they can solve the problem, discuss which version of the formula will be appropriate to use, and details, like the average height of floors in a multi story building. Encourage through questions some hypotheses, maybe a drop from the second floor. At this point there will be some discussion about how to mathematize the answer. One of the recurring problems for students deals with the square root solutions required to solve quadratics. Students should have already worked through the various ways to solve quadratics, so you will want to listen to the conversations surrounding these issues. Some students will be able to solve for the square and some will not. Have the student who does solve the square explain his/her understanding of the process. If students in each group come up with differing ideas, let them question, critique, convince, until they can agree on some solution. After all, their life depends on knowing how fast they must move! As you listen, decide which groups to call on for sequencing purposes. Bring the group together and let each group talk about what information they used to solve the height issue. As students speak, if someone realizes their mistake, let them correct it, then iterate the thought process – why did they think the mistake was reasonable? Continue to ask questions to guide the students through the ideas, asking students to reiterate what they heard another student saying; asking a student to clarify a point, to dig deeper into the thought process. They should, of course, come up with two answers, positive and negative. So the next question is which answer makes sense and why? What does the negative answer represent? What would have to happen for the negative answer to make sense? The students can practice their skills by asking them the same problem, only transferring the location to Mars. If the television dropped from the same height on Mars, would they have more time or less? Don’t forget to ask about doubling the distance. Let the students confirm whether or not that is true and why. This is a good time to pull the students together and have students restate the ideas they’ve heard. Watch and listen for evidence of a change in student understanding. Are they making the same errors or different ones? To cement the knowledge, have this similar problem ready: you are in a boat at the foot of a cliff. You look up and see a man tumble straight down. Develop some different scenarios for the height of the cliff and the time it takes him to fall. Okay, I won’t make you guess the standards and practices- but if you see any I missed, let me know! The activity supports all eight mathematical practice standards. The various individual, small group and whole group tasks give plenty of opportunity for formative assessment of math skill levels and understandings. The Mars thing – have either an internet access to look up the gravity on Mars, or have it ready and let the students who get done early work on the Mars formula for the rest of the class to use. They can do a mini present on how they got it. There are sure to be multiple paths students took to get the answers. Let whole group discussion offer opportunities for students to share how they thought about solving. Put the paths on the board and let students compare the paths – they will find ways to add some of these new paths to their own toolbox if skills! As always – feel free to use, modify, comment, and question. Thanks!